Iphone X is very popular cell phone, Becase it come with the super-sized display, More import, using Face ID, most durable glass, wireless charging...etc High Endurance Technology. When you use a certain amount of time the iphone X. you will meet many problems, such as iPhone X won’t turn on, Display Issues. but you know, Iphone X is not very easy to repair it, cos iPhone X logic board was folded in half, and the two layers then were soldered together. 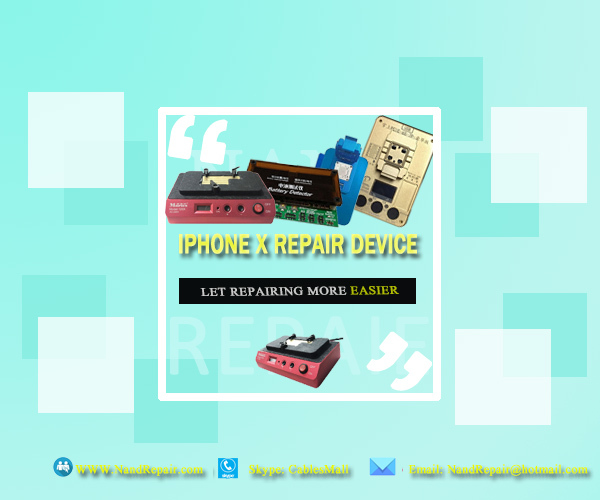 Today, we will introduce Four kinds of Essential Device For iPhone X Repairing, in order to let repair processing more easier. PPD120X is an high-quality Welding Platform Desoldering Demolition Rework Station for iPhone X A11 CPU. No need the hot Air Rework station, working on 230℃, Separate the iPhone X upper / lower logic board by PPD120X Pre-heating Rework Station, professional tool for repair iPhone X logic board in fast and efficient method. Nandrepair new JC PCIE 8 iPhone 8 8P X NAND Test Fixture not only can working on JC software platform, and but also can working on JC pro1000S machine. It doesn't Don't need boot NAND, don't need the engineering line, don't need batttery, touch switch control, identification the nand direction. when you meet iphone X battery problem, such as battery has held up admirably. how to find a effective solutions to fix iPhone X battery issue? is there a Battery Detector Tool For Iphone X? this Battery Detector Tool For Iphone X will help you out. of course, if you need other iphone repair tools, or such item can't solve your iphone X problem immediately, you can List your Iphone X issue, maybe we can talk about it here.... thanks in advance.